rose Tuesday after the industrial giant posted first-quarter earnings and sales that topped analysts' forecasts, and lifted the low end of profit guidance for 2019. United Technologies said Tuesday it expects adjusted earnings in 2019 of $7.80 to $8 a share, with the low end higher than previous guidance of $7.70 to $8. "United Technologies is off to a strong start in 2019," said Chairman and CEO Gregory Hayes. 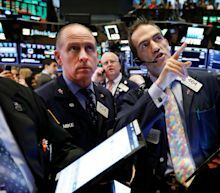 U.S. stocks were set to open slightly higher on Tuesday, as better-than-expected results from Coca-Cola, Twitter and a handful of industrial companies supported investor sentiment amid concerns about slowing profits. S&P 500 e-minis were up 1.25 points, or 0.04% and Nasdaq 100 e-minis were up 4.5 points, or 0.06%. The hit assumes Boeing's production rate of the 737 MAX jets staying at 42 aircraft per month for the rest of the 2019, Chief Financial Officer Akhil Johri said on a conference call with analysts. Earlier this month, Boeing cut the production rate on its 737 MAX jets to 42 units per month, from 52 per month. United Technologies earnings easily topped Q1 estimates for the Dow Jones industrial giant. United Technologies stock rose early Tuesday, near a buy point. The company's shares were up 4 percent at $142.50 in early trading, after it raised the low end of its 2019 forecast for adjusted earnings per share by 10 cents to $7.80, while keeping the upper end unchanged at $8.00. UTC, whose stock has risen 10 percent since the fatal crash in Ethiopia in March, said it is benefiting from better-than-expected performance of its recently acquired aero parts maker Rockwell Collins. Shares of aerospace suppliers have been under pressure following the second deadly crash of a Boeing Co 737 MAX jet within five months, grounding the planes and forcing Boeing to cut production of its best-selling jets. Shares of United Technologies Corp. rose 2.8% in premarket trade Tuesday after the company reported earnings and revenue that beat expectations and boosted its full-year outlook. Profit for the latest quarter rose to $1.346 billion, or $1.56 per share, compared with $1.297 billion, or $1.62 per share, in the year-earlier quarter. Adjusted EPS was $1.91 a share, beating the FactSet consensus of $1.71. Revenue for the quarter came in at $18.365 billion, beating the FactSet consensus of $17.996 billion and higher than $15.242 billion a year ago. The company raised its full-year outlook, saying it now expects an adjusted EPS of between $7.80 and $8.00, compared with its previous estimate of between $7.70 and $8.00. Shares of United Technologies have gained 29% in the year to date, while the S&P 500 has gained 16%. United Technologies unveiled better than expected quarterly earnings and upgraded its outlook for this year amid strength in the US industrial conglomerate’s aerospace systems and elevators businesses. A rally in the US dollar dented the overall revenue growth rate by 3 points. Chief executive Gregory Hayes said UTC had a “strong start” to this year. Carter Copeland, aerospace and defense researcher at Melius Research, joins "Squawk Box" by phone to discuss United Technologies' earnings beat and what to expect from the company going forward.